This little bug is found in many stillwaters, from rich lowland lakes and reservoirs to more acidic nutrient-poor hill lochs. Without gills, the corixa relies for its aquatic existence on regular visits to the surface to replenish its air supply. This it holds as a quicksilver bubble wrapped around its abdomen. Various imitations are available for the corixa but many are far too big and bulky to be truly imitative. This simple pattern, tied on either a size 12 or 14 hook, combines a pale, fur body capped with a shellback of hen pheasant tail, which has a mottling very similar to the back of the natural corixa. The body fur is dubbed on quite thickly, but evenly, to produce the corixa-like profile. The bubble of air, which gives the body of the corixa its typical sparkle, is suggested by using a rib and tag of pearl tinsel. The paddle-like legs, which the corixa uses to propel itself beneath the surface, are imitated by a sparse hackle of brown partridge which, being very soft, also gives the finished fly a touch of movement. 1. Fix the hook in the vice and run on the tying thread at the eye. Carry on down the shank to a point opposite the barb and catch in two inches of pearl tinsel. 2. 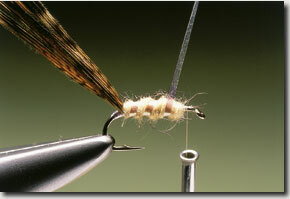 Take the thread back up the shank a little then wind on two or three layers of the pearl tinsel to form a tag. Secure the loose end of the tinsel. 3. Take a slip of well-mottled hen pheasant tail and catch it in by its tip at a point just in front of the tag. 4. Catch in a second two-inch length of pearl tinsel at the base of the tail. Cover the waste ends of the pheasant tail fibres to create an even base then select a good pinch of light tan fur. 5. Using a twisting motion between finger and thumb, dub this fur on to the thread to form a thick tapered rope. 6. Begin winding the dubbed fur over the hook shank. Overlap the turns towards the middle to help create bulk. 7. Carry on winding the fur to a point just short of the eye to form a chunky, beetle-shaped body. 8. With the body in place, wind the pearl tinsel over in open, evenly spaced turns. Three or four turns are ample for a pattern of this size. 9. Take a well-marked brown partridge feather and, after stroking the fibres back against the grain, catch it in by its tip. 10. Wind on just one or two turns to create a very sparse hackle. Secure the stem in place with turns of thread. 11. Remove the excess hackle before stroking the fibres back so that they sit beneath and along the sides of the body. 12. Draw the hen pheasant tail fibres over the top of the body and secure with thread, just behind the eye. 13. Ease the fibres a little around either side of the body before removing the excess. Finally, build a small, neat head and cast off with a whip finish. The natural corixa is found in large numbers in most lakes and reservoirs. It lives in relatively shallow water, usually less than two feet deep, and can often be seen scuttling around in the margins. However, during the summer corixids will populate weed beds that have formed in deeper water and at this time they can be found well away from the shore. Although corixids can be found throughout much of the year, it is during the summer that their numbers rocket and the trout will feed heavily upon them. The pattern needs to be fished on a floating line either close to the bank or around the edge of weedbeds, as it is these areas that hold the greatest number of naturals. The pattern can be fished singly, twitched or retrieved with a steady figure-ofeight around these areas. It can also work well when used on a dropper and teamed with a damselfly nymph imitation on the point. 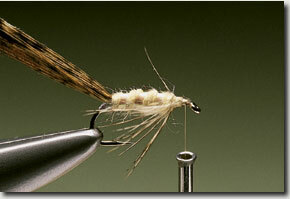 Tie the partridge hackle in by its tip and keep the effect really sparse by adding only one or two turns.